Web Testing includes testing of web application to ensure that it is functionally correct, reliable, scalable and perform well with varying user load. It involves testing both the client and server side components of the Web application. AppPerfect fully supports both client side front-end Web Functional Testing as well as back-end server side Web Load Testing. Web Functional Testing : All applications are designed and developed to meet and satisfy certain functional needs. A functional need may be technical, business, or process based. Functional Testing is the process by which expected behavior of an application can be tested. Functional testing is use of software program to detect if your web application is functionally correct. Functional testing of web applications involves testing of front-end or user interface of your web applications running in web browser. Functional testing includes automating manual testing tasks which are mostly time consuming and error prone. Functional testing is a more accurate, efficient, reliable and cost effective solution to manual testing. Functional testing involves carrying set of tasks automatically and comparing the result of same with the expected output and ability to repeat same set of tasks multiple times with different data input and same level of accuracy. 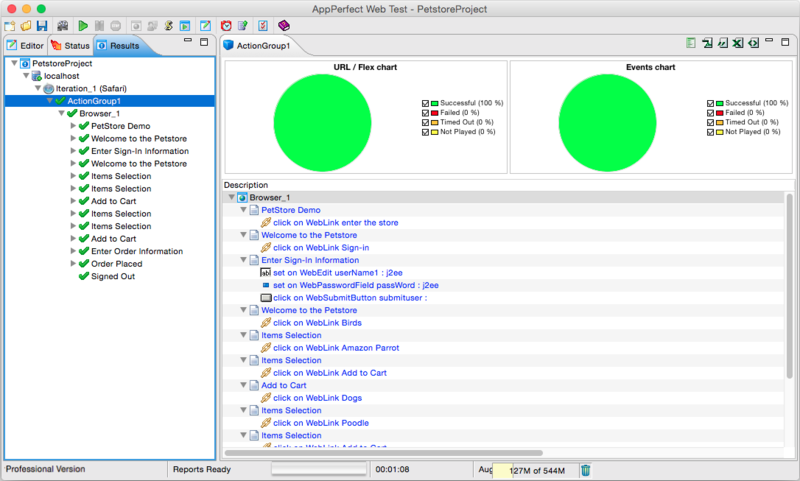 Functional testing of web applications can be implemented using AppPerfect Web Test. AppPerfect Web Test is a fully Automated Web Functional testing and Regression testing software. Any application accessible via a Web browser can be tested. AppPerfect Functional Tester is designed for developers as well as QA professionals. It provides a rich set of features in an easy-to-use manner that makes both groups productive immediately. Implementing functional test for your application early in the software development cycle speeds up development, improves quality and reduces risks towards the end of the cycle. Web Load Testing : Load Testing of web applications involves testing the performance and scalability of your web application on server side with varying user load. Load testing involves simulating real-life user load for the target web application. It helps you determine how your web application behaves when multiple users hits it simultaneously. Load testing with different load strategies and conditions helps you determine software design issues like incorrect concurrency/pooling mechanism, poor optimization, memory build-up, etc. Load Testing helps you identify server configuration issues with Web server, application server, database server, load balancer, etc. Load Testing helps you detect if your current infrastructure is sufficient to meet your user demand. Load Testing helps you determine the peak user load your application can sustain, number of concurrent users your application can support, and whether or not your application will scale as more users access it. 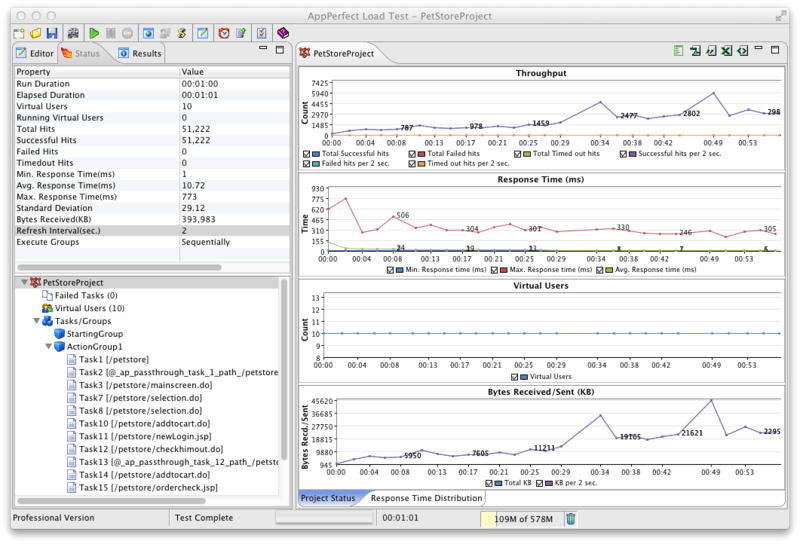 Load testing of web applications can be implemented using AppPerfect Load Test. AppPerfect Load Test is a fully Automated Load test, Stress test and Performance Test solution that is easy to use and cost effective. Most application performance and stability issues arise only when the server is stressed with a high user load. AppPerfect Web Load Test helps you design and simulate thousands of users in a realistic manner which can be used to load test your application infrastructure for performance, reliability and scalability. Apache, Hadoop and HDFS are trademarks of The Apache Software Foundation. Splunk is a trademark of Splunk Inc.